Dumbo is an all-time classic. I love it. Released in 1941, this was Walt Disney’s fourth animated feature, and it stands today as an example that great movies don’t have to cost a zillion dollars. 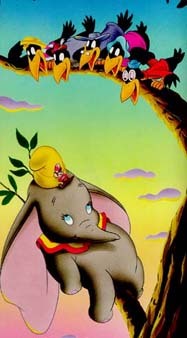 Designed to recoup the financial loss of Fantasia, Dumbo had a much smaller budget than any previous animated feature. Despite the diminutive cost (or because of it? ), the studio still managed to create a complete gem. The word that comes to mind is “charm” – Dumbo has a charm that isn’t found in many other movies. It has lots of humor, lots of heartbreak, and a lean pace that keeps anything from feeling too stagnant. Throw all that in the mix and Dumbo easily garners an 8.5/10. Flying elephants – Admittedly, this story is pretty ludicrous; everyone knows that elephants can’t fly when they’re that young. But seriously, Helen Aberson is a genius. She’s the one who concocted the notion of a flying elephant, and somehow, it makes total sense. And kudos to Disney for seeing the potential. Mother/son connection – The relationship between Dumbo and his mom is great. Mama Jumbo displays a fierce love for her son, and no matter whether protecting him from ridicule or gently rocking him to sleep, it’s really touching. In a world full of messages of self-absorption and vanity, watching selfless love play out (even among elephants) feels more right than ever before. Timothy has a plan, and it involves a feather. 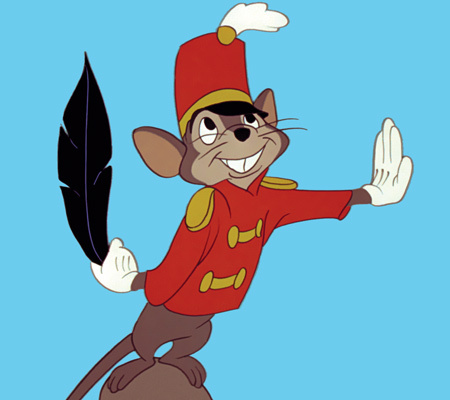 Timothy the Mouse – Disney has a history of including small, helpful sidekicks in their films. From Jiminy Cricket to Gus Gus to Roquefort to Bianca and Bernard, the Mouse Guys show an understanding of how using the “little guys” can ratchet up a picture’s emotion. After all, part of the drama comes from the fact that the sidekicks are so small, right? I mean, Arnold Schwarzenegger and The Rock are awesome in their own way, but they aren’t really touching – one-man armies don’t conjure up much emotion. But a little mouse on a crusade? Cue the “Awwwwww”s. We gobble that junk up. Timothy is another example. He just hates to see the little pachyderm mistreated, tries to help him, and eventually playing a significant role in the climactic flying scene. And, he’s really feisty and apparently from New York, giving him a street-smart vibe that we connect with, another common Disney archetype. Timothy is a great character. BTW – I find it interesting that the smallest character gets the biggest paragraph. I didn’t plan that. The Black Crows – I love love love love love love love love love love love love love love love love love love love love LOVE “When I See An Elephant Fly”. The wordplay is fun, the swing feel is rad, and the crows’ dance moves are swag to the maximum. Some people make a big deal about the fact that the crows are voiced by African-American fellows, like it’s racist or something, but the fact is, they’re the free creatures of the film, the ones not beholden to anyone. And they’re really fun. I don’t know for sure, but those things don’t seem bad to me. The clowns – Dumbo‘s clowns are pretty hilarious. I love their nonsensical discussions, especially the part about raising the jumping platform, as if the audience will like the stunt twice as much if the platform is twice as tall. 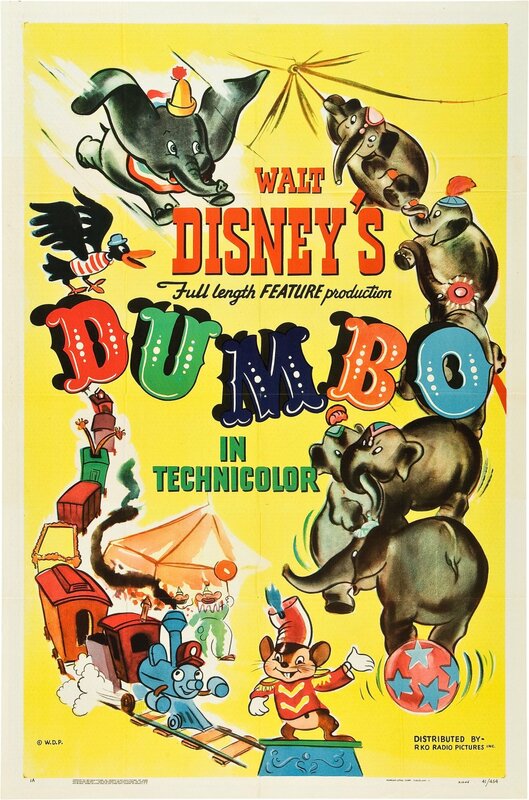 Take into account the funny clown conversations, the wordplay of the crows, and the ridiculous Ringmaster and I would say Dumbo‘s writers were on a major roll. Animation/Art – As a cost-cutting measure, Disney’s animators left out lots of character details, instead focusing on getting the major lines right. The result is a unique-looking show. One of the standout moments is the scene when the workers are putting up the bigtop – they are just featureless man shapes. It really keeps the attention off the men and on the rhythm of the scene, a brilliant move most studios wouldn’t even consider unless they were trying to save $$. On the flip side, the lack of details does make Dumbo look more like a cartoon sometimes, but taken on the whole, the art/animation style really works. Pace/Maturity – I mentioned that Dumbo has a brisk pace. It’s true – 64 minutes is barely long enough to even be considered a feature. Still, in 64 minutes, director Ben Sharpsteen was able to squeeze in humor, emotion, songs, thrills – everything you could want in a film. Could he have gone longer? Maybe, and without financial limits, he might’ve. But he didn’t, and the result is a full, brisk movie that displays maturity and restraint on Sharpsteen’s part. Espn.com’s Rick Reilly once said that, when he writes, he gets every thought onto paper and then begins a process of tightening. The tightening process cuts away the excess fat, leaving a meaty sequence of ideas that are concise and weighty, each point packing a punch. In the same way, nearly every aspect of Dumbo hits hard. They had to, for there was no room in the budget for fat. And thank goodness – the movie is better for it. NOTE: another benefit of 64 minutes – you can start the movie at 7 and have the kids in bed at 8:04. It’s a win-win! In all, Dumbo is a great movie. It has humor, emotion, and a wonderfully brisk pace. It stands as a testament that more isn’t always more, and it has something for just about everyone. Great film! 8.4/10. I be done seen about everything when I see an OLD WOODEN SHIP in outer space. 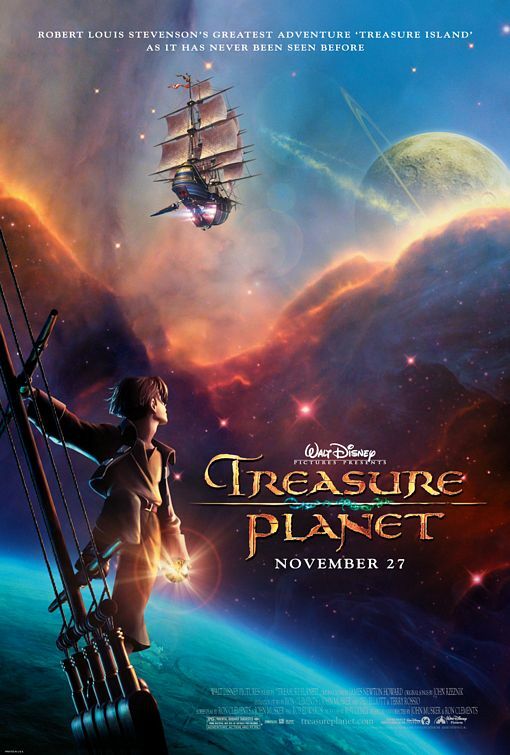 This review covers Treasure Planet, the crappy “film” Disney unleashed on the world in 2002. I give it a 4.9/10 which, if I’m not mistaken, is the lowest score I’ve given to any movie yet. I can’t say it’s the worst movie I’ve ever seen since I’ve had the misfortune of seeing Indiana Jones: Crystal Skulls or whatever that piece of garbage was called. 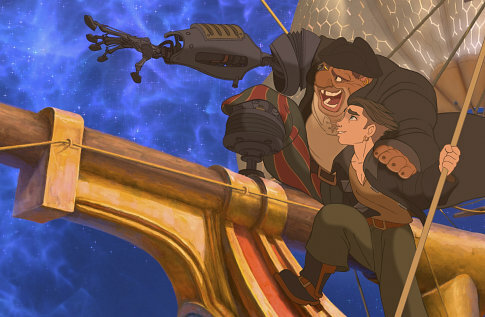 But of the Epic Disney Watchfest, Treasure Planet is definitely the weakest. In my review of The Rescuers Down Under, I coined the phrase “Avatar Effect”. The Avatar Effect is this: movies that exhibit major technological leaps in movie making are nearly always considered to be really great films, even if they contain glaring shortcomings. So Avatar, for example, pioneered breathtaking, HD, native 3D filming, and though it features a fairly weak story, it is seen as one of the best motion pictures in recent history. I mention the Avatar Effect because it seems as though it has met it’s match in Treasure Planet. 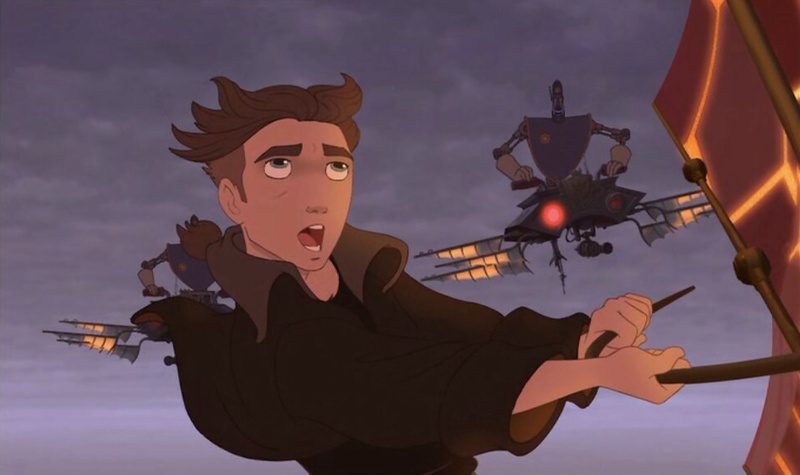 For, though Treasure Planet exhibits a major leap forward in hand-drawn animation, it still has so much wrong with it that very few people consider it even a good film much less a great one. The technological leap I’m referring to is the use of CGI backgrounds. To be more precise, this film features hand-drawn 2D animation over a fully 3D computer animated world. Sounds cool, right? I mean, Disney had been pushing in that direction since the 80’s, with some dazzling results ie The Lion King, Tarzan and even Atlantis: The Lost Empire. Well, Treasure Planet could’ve been awesome, but in the push to a completely 3D world, it seems as though Disney forgot that the story must still work. Now, when I say the story doesn’t work, I’m not saying everything is broken. I’m saying that the sum of broken parts is so great that the whole picture falls apart. For example: nonsensical choices. The plot is based on Treasure Island by Robert Louis Stevenson. Treasure Island is great! It has pirates, treasure, old wooden ships, and lush tropical environments. Seems like a movie based on that can’t miss, right? Well, Treasure Planet has all those things, except it’s set in outer space rather than the tropics. Like, literally, it has pirates, treasure and OLD WOODEN SHIPS in outer space. What?????? That defies everything. Apparently the directors decided to make the characters able to breathe in outer space or something. Oh, and though they’ve developed the ability to travel to other planets, they use ships based on 17th-century wooden boats. It makes no sense. Another example: characters. Most of the characters in Treasure Planet are uninteresting or unlikable. Jim Hawkins, for example, is changed from being an earnest young man in the book to being a brooding, angry kid in the film. Not really a change for the better. And Long John Silver. Ughhhh. He is inconsistent at best. One minute he’s the harbinger of danger for Jim, the next he’s playing the father figure in a musical montage, showing Jim how to do stuff on an OLD WOODEN SHIP in outer space. Then, he’s completely betraying Jim and then *SPOILER ALERT* he’s changing back to helping Jim. What? It’s really bizarre. Jim can’t believe his agent booked him for this. A third example of how the movie doesn’t work: visuals. For a movie breaking new ground visually, Treasure Planet has some really unattractive graphics. The film features lots of browns, blacks, golds, blues – not a rich tropical spectrum like in the book. Now, I’m okay with the film looking different than a straight interpretation of Treasure Island, because if I were adapting a 17th-century story for outer space, I would certainly operate with the understanding that space doesn’t look like 17th-century Earth. What I’m not crazy about is the fact that, apparently, the directors wanted to make the film in space while simultaneously avoiding design choices akin to stories based in space. So where I would have lots of cool-looking spaceships, they used OLD WOODEN SHIPS. Where I would’ve given the crew rockin spacesuits, they gave the crew 17th-century garb. And where I would make every man-made structure very futuristic, they made most of the structures less-than-futuristic. It just does NOT work. It doesn’t work! It doesn’t work it doesn’t work IT DOESN’T WORK!!!! AHHHHH!!!!! Why would they think it’s okay to have OLD WOODEN SHIPS in outer space?????? 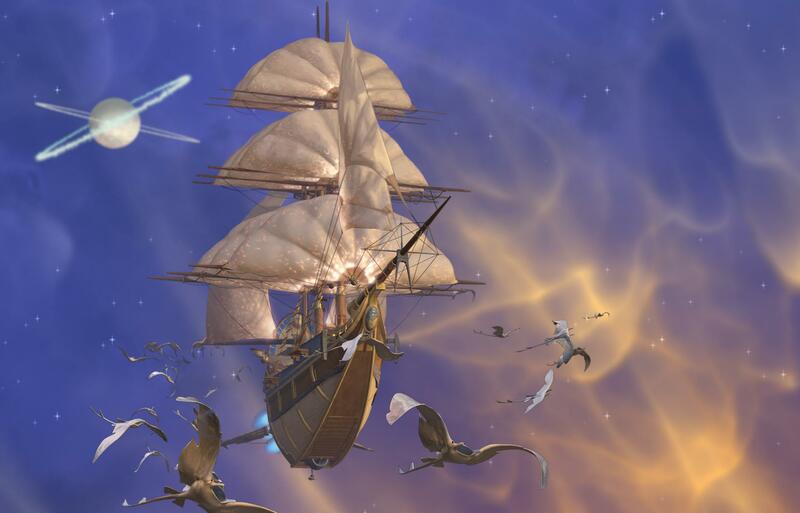 Last of all, I would make Treasure Planet lush and tropical. Not some weird brown planet thing place. Martin Short and Joseph Gordon-Levitt talk while Dane A. Davis looks on. So is there anything good about Treasure Planet? Yes! I liked Morph, the weird little morphing creature, and I liked that Martin Short voiced one of the characters. He’s the best. And from a curiosity standpoint, I liked hearing Joseph Gordon-Levitt as Jim Hawkins. But those three paltry items fail to make up for everything else. My last thought: the CGI isn’t even that impressive. So, the movie is supposed to be this big leap forward into a new dimension of hand-drawn animation. Well, if I hadn’t read that before watching I might never have known. Sure, the film features a more mobile camera (something hard to pull off with 2D backgrounds), but being able to move the camera is hardly groundbreaking cinematically-speaking. It might be groundbreaking for hand-drawn animation, but who cares if the films stinks? Some call it steampunk; I call it really, really crappy. Overall, Treasure Planet is a pretty crappy movie. It features lots of nonsensical choices, unlikable characters and bad visuals. I would only really recommend it if you want to have an Epic Disney Watchfest of your own. Otherwise, skip it. 4.9/10. Grant Stevens has loved writing since a young age. He also love Dr. Pepper. Maybe there’s a connection? In addition to writing, Grant loves apologetics and writes, records and performs music. Check out his awesome music at www.grantstevensgroup.com and www.soundcloud.com/grant-stevens-amazing. You know, everytime I see someone starting a review of Treasure Planet with “they put it in space! how dare they!” I doubt that the reviewer really bothered to gave the movie a chance. I love Treasure Island. It was my favourite book as a child and I have seen every adaption of it I could get my hands on. And one thing I learned early on is: Most of them are crap (and that includes the highly successful 1950 version of Disney). It’s partly the book itself, which is hard to adapt especially if you do it in a movie and not a mini-series. Something just will get lost. But it’s also because the one weakness of the book are the characters. Long John Silver is an outstanding character and carries the whole book, but everyone else are just annoying stereotypes or, in Jim’s case, bland. And most adaptation don’t bother to play with the characters in a way which makes sense. Disney did. They shrugged away a lot of stuff which usually bogs other adaptions down by changing the setting, rewrote the characters in a way which made sense (though the Disney version of Ben Gunn is still annoying, but they didn’t MADE him this way, this character has always been annoying) and they made a take on the story, which was refreshingly different. And if you do a source text which has been done so many time, you better find a new angle, or you leave it be. 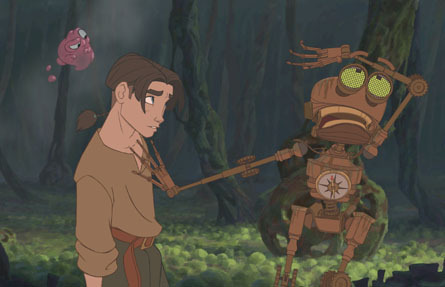 I think that Treasure Planet is easily one of the best adaptations of the book. It doesn’t have the best Silver (not by a long shot), but the best Captain and the best Jim (it’s hard to make the rebellious teenager without him making a brat, but Jim works, mostly because any divorce child will understand the feeling of anger he has to deal with). It does have it’s flaws – but not more so than some movies which are hailed as great work of animation. Yeah, but isn’t that the fun? It’s not like the animators just throw that in – they actually had a pretty good idea how this stuff was supposed to work (the DVD’s extras are really great, because it shows that they could have built an entire world on this). And I personally love that they didn’t go for the popular futuristic style of Start Trek or Babylon 5, but tried to do something new, something which still references the original (plus, there already is an adaptation with the futuristic style you had in mind, a fairly good one even, so I’m doubly glad that they went in another direction). Your comment reminds me of an important point: art is subjective. I would prefer spacesuits and spaceships, but you love the choice Disney made. Our opinions are equally valid, and that’s the beauty of art – it speaks to our personal experiences and touches us all differently. Regarding your point that the animators didn’t just throw in the 17th century stuff – I agree. SOMEone had to make the choice to go that direction, and I’m sure they did everything they could to serve that artistic choice. It was a risk, and imo it flies in the face of modern realism and instead hearkens back to the fantastical literature of Johann David Wyss and Jules Verne. It reminds me of something more like Journey to the Center of the Earth than Star Trek.